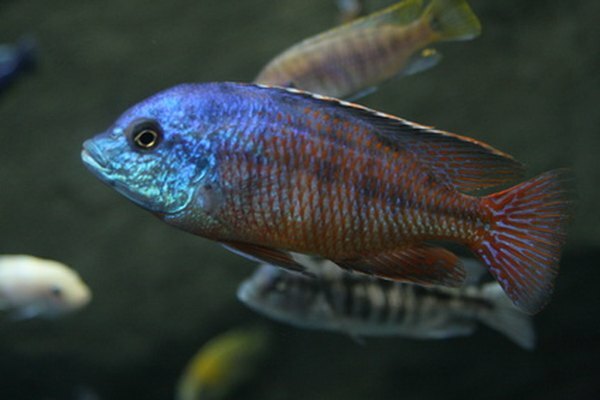 African cichlids thrive in captivity with proper care. If you are looking for active, colorful fish as your first pets together, African cichlids might be for you. These freshwater tropical fish are beautiful, and they're friendly in a group of the same species. With the proper tank setup, a school of cichlids will be attractive and interesting aquatic pets. A larger aquarium that is 30 gallons (120 l) or larger is a good choice for a cichlid tank. African cichlids are aggressive fish, and though they get along with other cichlids, small spaces can encourage their fighting nature. A spacious tank will provide room for your finned friends to get along nicely together. Cichlids are active swimmers, and they thrive when they have room to swim freely and quickly around their environment. Additionally, if you would like your family of cichilds to grow, females are more likely to spawn and young more likely to survive in a spacious tank with plenty of room to hide. African cichlids originate from rocky, tropical lakes. In captivity, they thrive in hard water. The pH balance, or amount of acidity and alkaline, in your cichlid tank should range between 8.0 to 8.6. A simple way to keep the hardness of your tank water elevated is to add a piece of coral or natural shells. These items add minerals and acidity to the watery environment. As for the temperature of your African cichlids' water, these little guys thrive in warm water ranging from 74 to 78 degrees Fahrenheit (23 to 26 Celsius). African cichlids enjoy having hiding places in their tanks. However, these active fish also spend a lot of time rooting around objects and can easily move those that are too lightweight. Large stones, shells and aquarium decorations in the shape of caves are ideal because these cichlids cannot dislodge them from their locations. They also provide necessary hiding spots for your aquatic pets. Natural plants are the best choice for aquascape, because cichlids can effortlessly uproot the plastic kind. As for your choice of substrate, or the material that you will use to cover the bottom of your tank, aquarium pebbles, gravel or sand will provide a floor covering that will simulate your fish's natural tropical lake habitat. These types of substrate also encourage cichlids to root around for food and to spawn. Your African cichlids won't get along with just any tank mates. Passive community fish like neons, barbs and tetras may look like dinner to your picky cichlids. When selecting tank mates, it's best to stick with other African cichlids that are similar in size. In addition, a group of six to 10 will allow your pets to form and school without overcrowding the tank.